Are you looking to replace gutters on your existing home, or purchase gutters for a new custom home in St. Paul, Minnesota? Or are you thinking of investing in gutter covers so you can avoid having to clean gutters from leaves and other debris? At Minnesota Seamless gutters we install seamless gutter systems to help solve current water problems, or prevent them from occurring in the first place. Seamless gutters are specifically designed to bring water away from the building and prevent water damage. When you decide to install gutters from Minnesota Leafless Gutters, our professionals will inspect your home and determine how to best protect your home. They will show you gutter size and style that will best suit your home, and talk to you to understand what you need or want. We even offer seamless gutter covers to not only offer you protection from water damage, but low maintenance so that you do not have to struggle on ladders cleaning your gutters out, but also waste your time on another task. We have over 110 colors to choose from. You can have great looking seamless gutters covered so you never have to climb up that ladder and scoop out leaves and debris—at surprisingly affordable price! So we have discussed the benefits of seamless gutters, but many people are worried about the appearance of these gutters to their home. 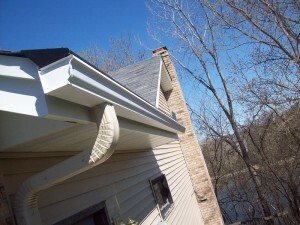 Do not worry, not only are seamless gutters practical but they are also aesthetically pleasing. Gutters and downspouts come in different styles, sizes and materials as well as colors. We have more than 110 colors to choose from to either match your home, or make a fun statement, whatever you imagine, the choice is yours. Finding the style appropriate size and perfect color are easy to do when you work with Minnesota Leafless Gutters. We specialize in gutters and downspouts made from enduring materials that will not break down when exposed to the elements, and this is important when you live in the harsh and drastic climates of Minnesota. We use the best metal in the industry for both commercial and residential and promise you, that you will not regret working with Minnesota Leafless Gutters. Give us a call today and we can help decide what is the best fit for you and help prevent water damage from your home and also eliminate the need to clean your gutters with our gutter covers! Don’t waste your time or money by installing anything less than the best.